Marion (Julie Delpy) is in a dead end relationship, and is considering leaving, the only problem is that she has a child with the man. She communicates regularly with Mingus (Chris Rock), her friend from work, about the problems they are having and how she is handling it. After months of suggesting that Marion walk out of the relationship, she finally agrees and walks into a relationship with Mingus, who is now her boyfriend. Marion is originally from France and Mingus is an American, so there is clearly some cultural differences between them, however, they are working on the pretext that the relationship is meant to be. Marion tells Mingus that they will be expecting some visitors, in the way of her father and her sister. From the moment her family hits the American customs there is a problem with some meat products that they are trying to smuggle into the country. The entire incident could have been a little more explosive, however, they managed to complete their official entry without any further incident. There is a photo exhibition getting ready to take place, but nothing can prepare Mingus for the eccentric behavior of his new found in-laws. It is an experience that will test the relationship from every angle. Although the trip is only supposed to last for a couple of days, it will be unforgettable for all involved and lives are changed. The sleeping arrangements for the overseas guests put further stress on the residents of the apartment, as small as it is, not to mention the fact that the sister's boyfriend was not supposed to be staying with them anyway. Mingus is taken aback by the open behavior coming from his girlfriend's family, he goes so far as to talk about them on his radio show. Julie Delpy writes and directs this comedy, in addition to playing one of the lead roles, with Albert Delpy as Jeannot, and Alexia Landeau as Rose. 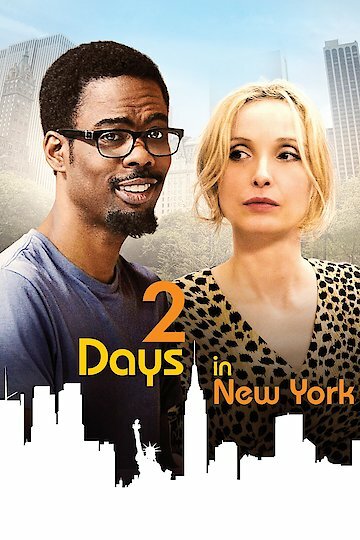 2 Days in New York is currently available to watch free on Tubi TV and stream, download, buy on demand at Hulu, Amazon, Vudu, Google Play, iTunes, YouTube VOD online.